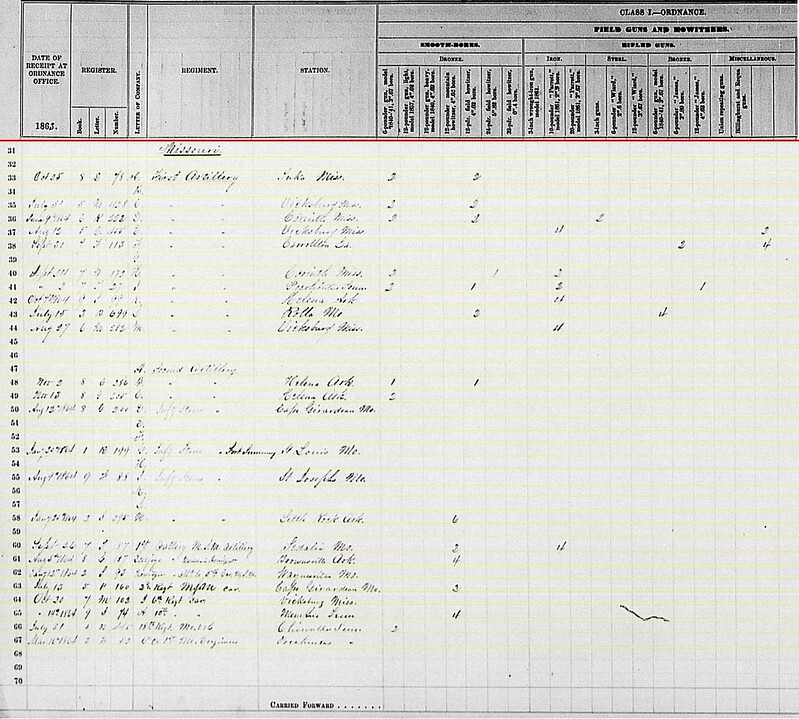 The Missouri section of the fourth quarter, 1862 summary statement lists sixteen batteries. 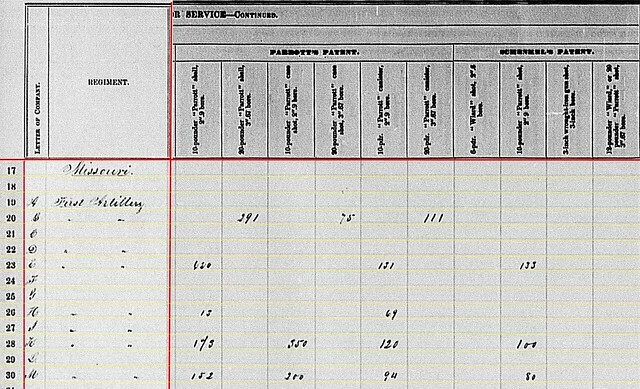 That covers all of the 1st Regiment, Missouri Light Artillery as a whole. It also includes bits and pieces of what would become the 2nd Regiment and some militia batteries brought onto Federal service at the time. 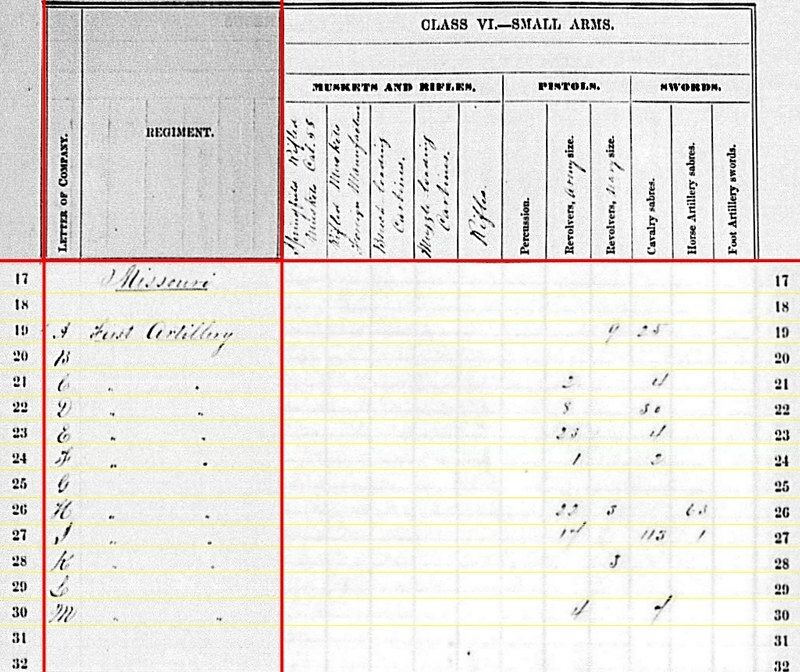 For this installment, we will look at the easy to interpret 1st Missouri Artillery. And “easy” is a relative term. The First Missouri Artillery had batteries assigned to the Department of Missouri, Army of the Frontier, the Army of Tennessee, and the Army of Cumberland. Four of the batteries – D, H, I, and K – served together as a battalion under the command of Major George H. Stone during the Battle of Corinth, earlier in October, 1862. However, the remainder were, as was common among the volunteer batteries, scattered around as needs required. Battery A: Helena, Arkansas. Four 6-pdr field guns and two 12-pdr field howitzers. This battery was part of the District of Southeast Missouri, but would shortly become part of the “new” Thirteenth Corps as reorganized under Major-General John McClernand. It’s battery commander was Captain George W. Schofield, namesake of the post-war Schofield revolver and brother of Major-General John Schofield. Battery B: Brownsville, Texas. Two 12-pdr “heavy” field guns and four 12-pdr field howitzers. Captain Martin Welfley commanded this battery. 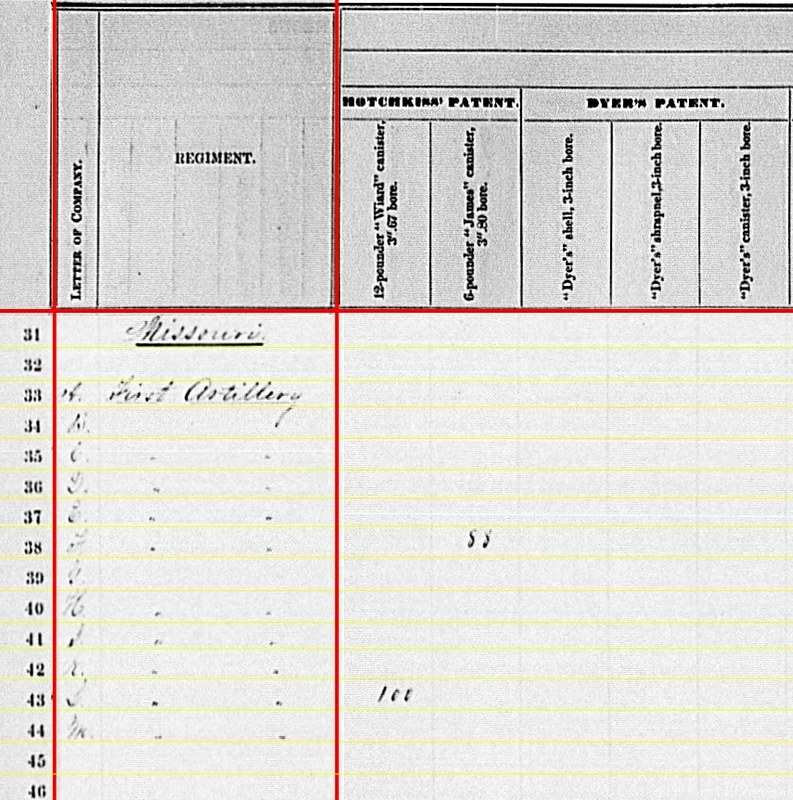 The location is certainly incorrect for December 1862. 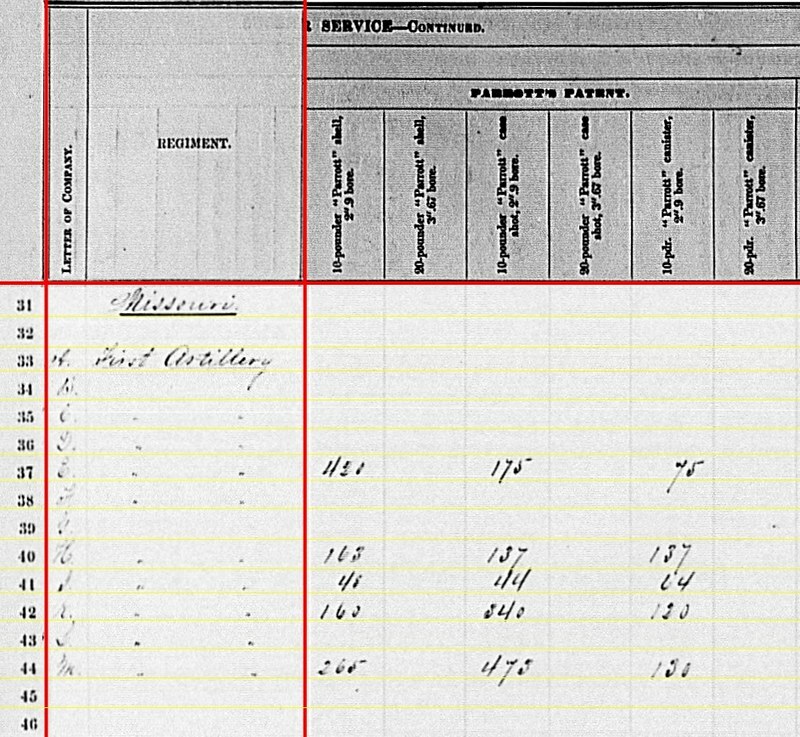 Likely that is tied to the date of the report’s receipt in Washington – April 1864. At the close of 1862, the battery was in Missouri. Welfley took the two heavy 12-pdr guns to Vicksburg when sent to the siege lines in June 1863. By September of that year, he reported four heavy 12-pdrs and only two howitzers. Battery C: No report. Part of the Left Wing, Thirteenth Corps in December 1862. Later reorganized into the Sixteenth Corps. Commanded by Lieutenant Edward Brotzmann. 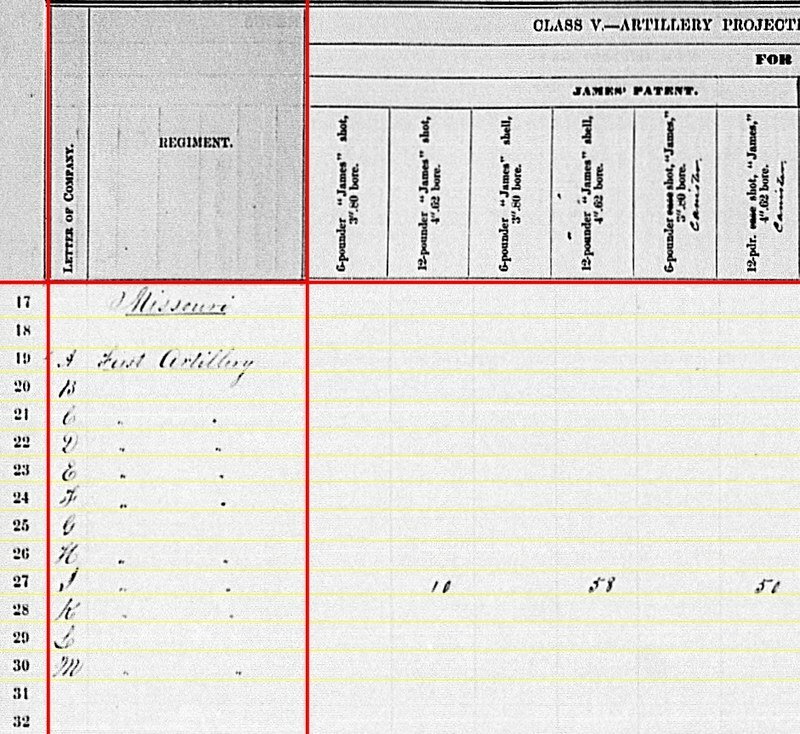 Battery D: Reporting from Corinth, Mississippi, with five 20-pdr Parrott rifles. Captain Henry Richardson commanded this battery. It was among those in Stone’s battalion earlier in the fall. The battery would spend time in Sixteenth and Seventeenth Corps during the winter of 1863. 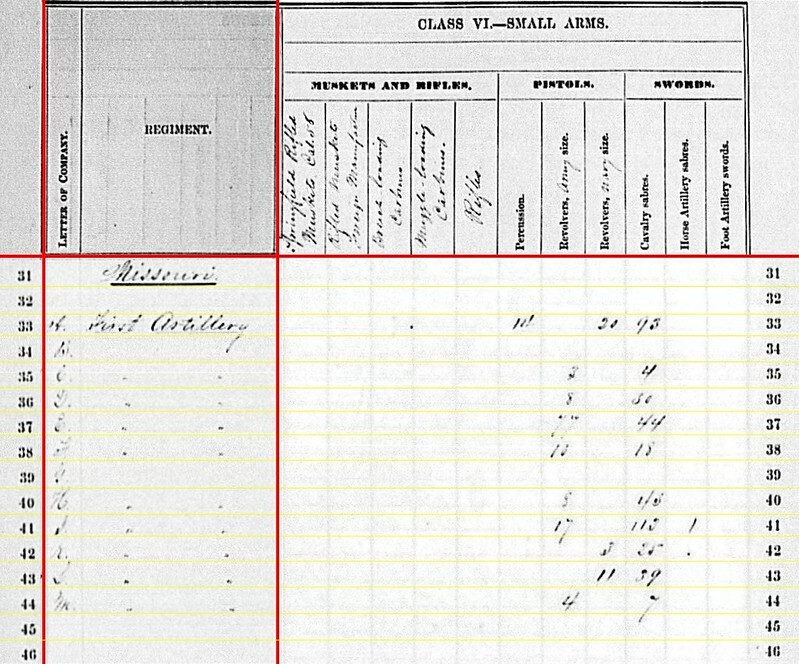 Battery E: At Fayetteville, Arkansas, with four 10-pdr Parrotts and two 3.5-inch “English Rifles.” Several notes here. First this battery was organized by Captain Nelson Cole, but by the Prairie Grove campaign, in the Army of the Frontier, it was commanded by Lieutenant Joseph Foust. Those English rifles were products of Fawcett & Preston in Liverpool, purchased by General John C. Fremont early in the war. Like other Civil War ordnance “enthusiasts,” I class these weapons as Blakelys based on caliber, projectiles, and loose affiliation of origin. 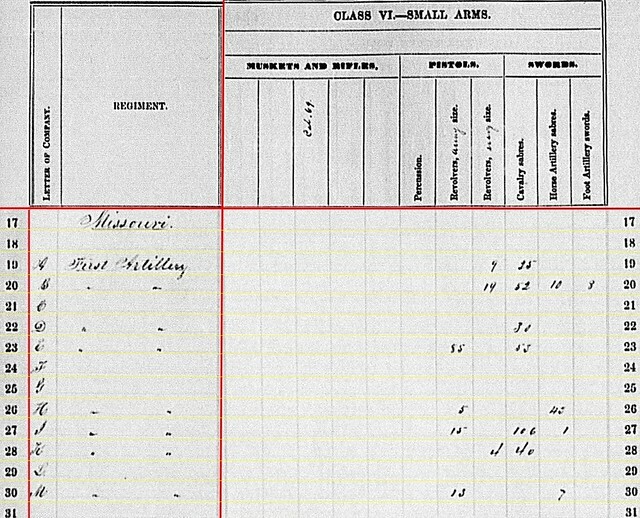 By September, Foust increased the number of English guns by one. Battery F: No report. This battery had also seen service at Prairie Grove. Captain David Murphy’s battery moved with a column to Van Buren, Arkansas after the battle. From notes about Prairie Grove, this battery should have reported a mix of James rifles and those Blakelys (or Fawcett & Preston, as you may prefer). Battery G: No report. This is Captain Henry Hescock’s battery supporting Third Division (Sheridan), Right Wing, Army of the Cumberland at the Battle of Stones River. Hescock was also the division’s chief of artillery at the time, and I’ve wondered if he performed both roles (division chief and battery commander) or delegated the battery to a senior lieutenant. His official report reads as if he retained command of the battery. 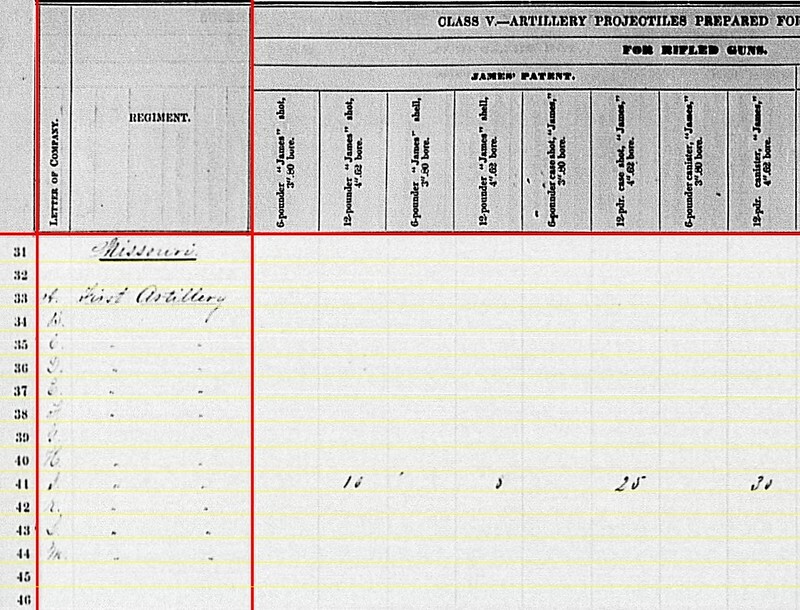 The battery fired 1,112 rounds at Stones River, lost one officer and 21 enlisted men, and reported short 37 horses. Battery H: At Corinth, with two 6-pdr field guns, one 24-pdr field howitzer, and two 10-pdr Parrotts. Was part of Stone’s battalion earlier in the fall. Commanded by Captain Frederick Welker. Also part of the Thirteenth Corps in December, 1862. By the end of the winter, the battery was part of Sixteenth Corps. Battery I: At Corinth, reporting four 6-pdr field guns and two 12-pdr field howitzers. I don’t know exactly when, but command of this battery passed from Captain William Pile, who went on to command the 33rd Missouri Infantry, to Captain Benjamin Tannrath. Like the other Corinth-based batteries, Battery I was part of the Thirteenth Corps at the end of 1862, but being part of the reorganization into the Sixteenth Corps. Battery K: Reporting four 10-pdr Parrotts at Vicksburg. They might have wished they were *in* Vicksburg that winter! 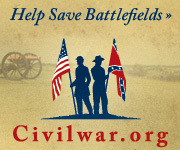 Maybe the Confederates would have appreciated the loan of those Parrotts that winter! Certainly this is a transcription error. This was George Stone’s old battery and part of his battalion at Corinth. 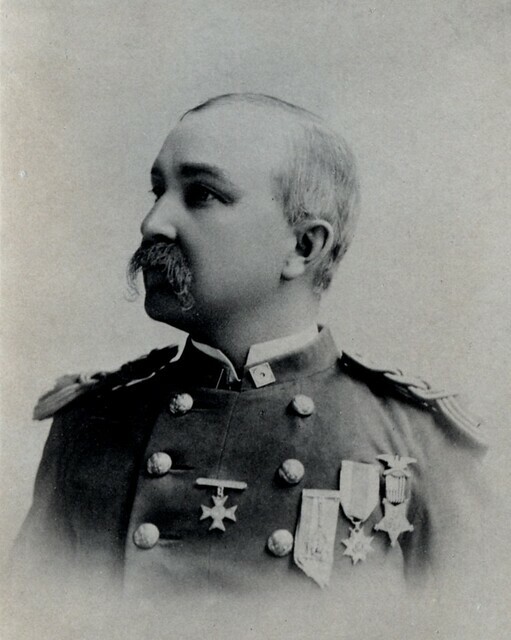 Captain Stillman O. Fish had command of the battery, with Stone managing a “battalion” and later unbrigaded artillery at Corinth. Battery L: No report. This was Captain Frank Backof’s battery which fought at Prairie Grove. They had four James rifles and two 12-pdr field howitzers. By the end of the month, the battery was at Van Buren, Arkansas. Battery M: No location indicated, but with four 10-pdr Parrott rifles. The battery was part of the Left Wing, Thirteenth Corps (soon to be the Sixteenth Corps) and stationed around Jackson, Tennessee. Battery commanded by Captain Junius W. MacMurray. And many of MacMurray’s papers are in the Princeton University Library,which according to the description “include quartermaster’s lists, invoices, and returns.” Should anyone have access to those, I’d be interested if copies of MacMurray’s Ordnance Returns and other “cannon” related documents are in that set. These lines are interesting, if for nothing else with the inclusion of the 24-pdr unfixed ammunition. 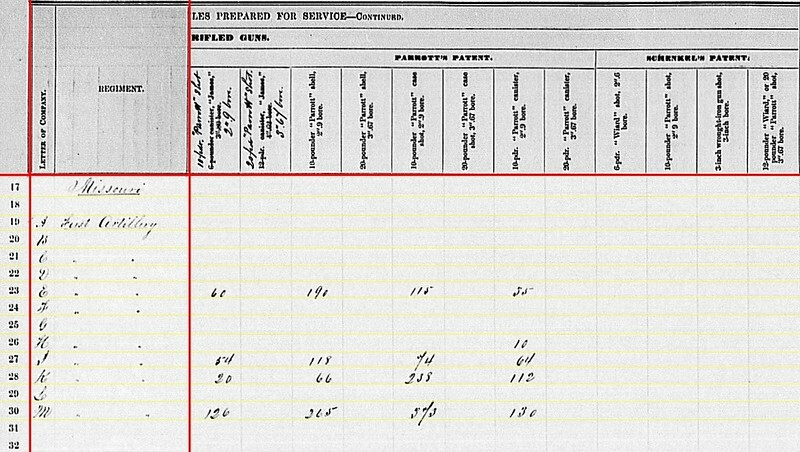 Battery A: 6-pdr field gun – 400 shot, 308 case, and 188(?) canister; 12-pdr field howitzer – 11 shells, 156 case, and 27 canister. Battery B: 12-pdr field gun – 128 shot, 84 case, and 32 canister; 12-pdr field howitzer – 340 shells, 358 case, and 64 canister. Battery H: Reporting nothing for the 6-pdr guns, but for the 24-pdr field howitzers – 109 shell, 62 case, and 66 canister. Battery I: 6-pdr field gun – 169 shot, 437 case, and 222 canister; 12-pdr field howitzer – 120 shell, 109 case, and 145 canister. Battery K: 6-pdr field gun – 98 case and 28 canister. Yes, just one entry – Battery D had 38 Wiard-type 3.67-inch shot. Yes, 20-pdr Parrotts had a 3.67-inch bore, nominally. Battery B: 20-pdr Parrott – 291 shell, 75 case, and 111 canister. 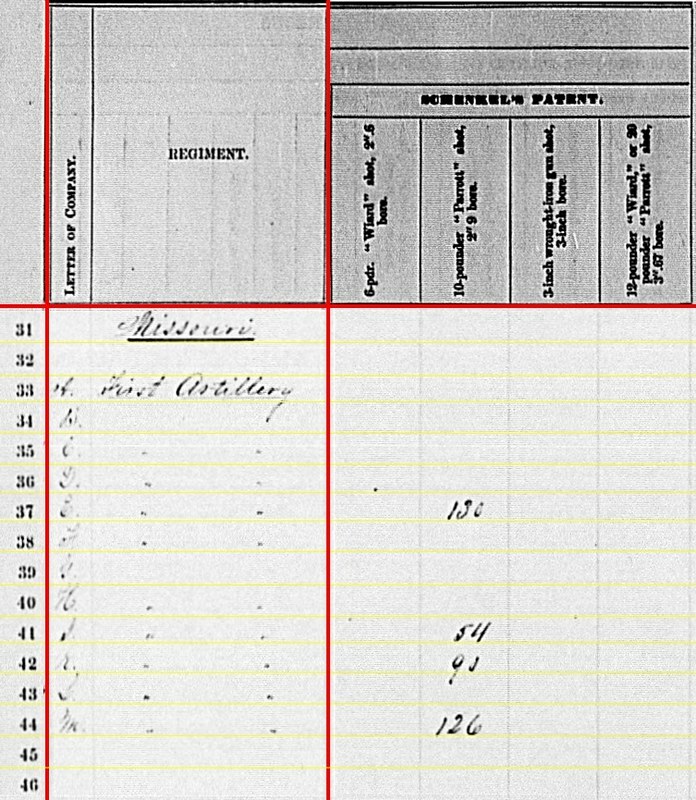 With the battery armed only with smoothbore, this might be quantity under the charge of the battery at a garrison in Missouri. Or perhaps another transcription error, putting the entries for Battery D on the wrong line? Battery E: Parrott projectiles for 10-pdr Parrott – 420 shell and 131 canister. Schenkl for 10-pdr Parrott – 133 shot. Battery H: Parrott for 10-pdr Parrott – 13 shell and 69 canister. Battery K: Parrott for 10-pdr – 175 shell, 350 case, and 120 canister. Schenkl for 10-pdr Parrot – 100 shot. Battery M: Parrott for 10-pdr – 152 shell, 250 case, and 94 canister. Schenkl for 10-pdr Parrot – 80 shot. Now for the small arms! Battery A: 9 Navy revolvers and 35 cavalry sabers. Battery B: 19 Navy revolvers, 52 cavalry sabers, 10 horse artillery sabers, and 8 foot artillery sabers. Battery D: 30 cavalry sabers. Battery E: 85 Army revolvers and 53 cavalry sabers. Battery H: 5 Army revolvers and 45 horse artillery sabers. Battery I: 15 Army revolvers, 106 cavalry sabers, and one horse artillery saber. Battery K: 4 Navy revolvers and 40 cavalry sabers. Battery M: 13 Army revolvers and 7 horse artillery sabers. 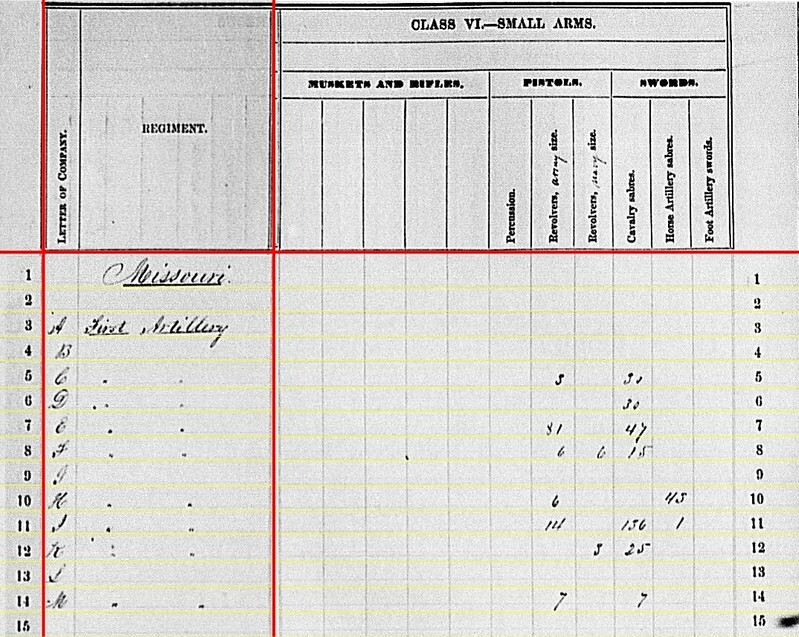 The 1st Missouri Artillery entries were a lot of “finger work” and research on my end. And I am still not happy with all the validations for the batteries and their armaments. I would stress again this is the “summary” reflecting what was reported from paperwork received at intervals in Washington. We don’t know if one clerk did all the work… or if a team of clerks were involved. In short, we don’t have a clear picture of how the paperwork was processed. Thus we have to add questions about data integrity. 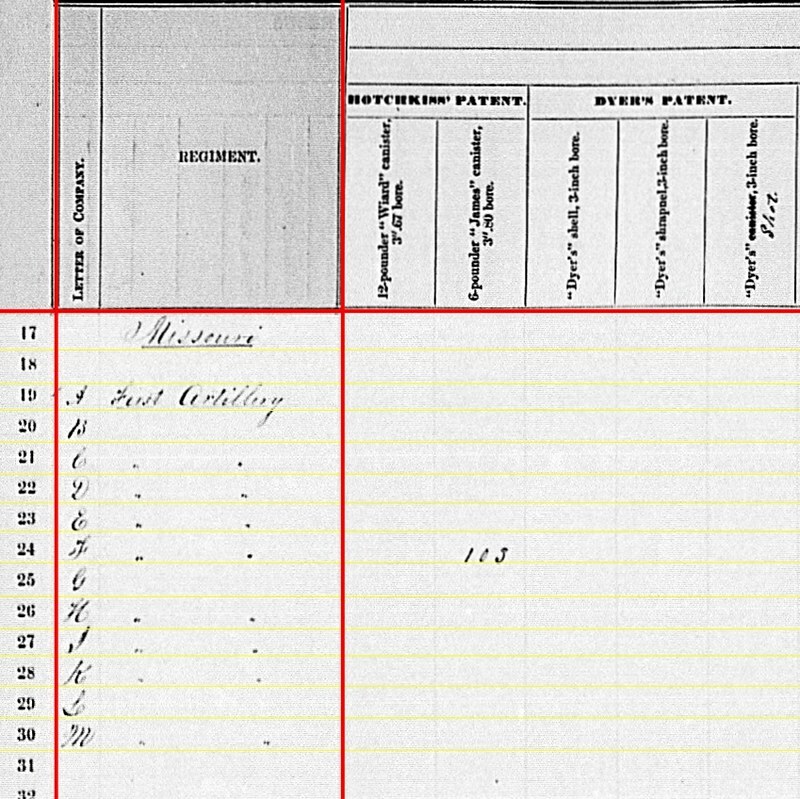 On to the 2nd Missouri and the State Militia batteries….